Dan Katt stands in front the future home of the second Good City Brewing taproom. 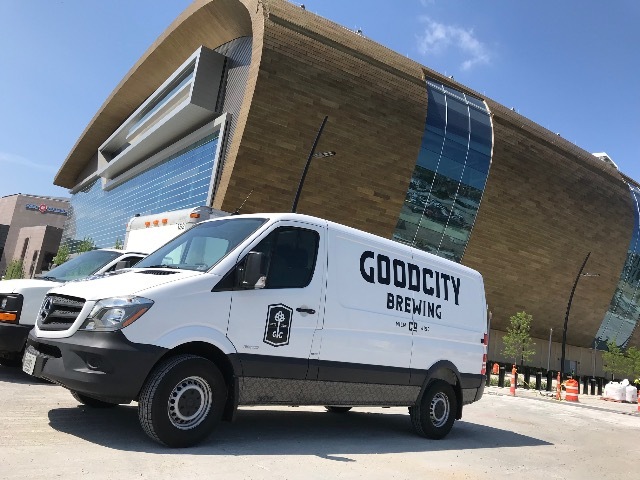 Published May 31, 2018 at 3:16 p.m.
Milwaukee was all abuzz about beer this morning – and not just because we're Milwaukee and it's day of the week that ends in "day." 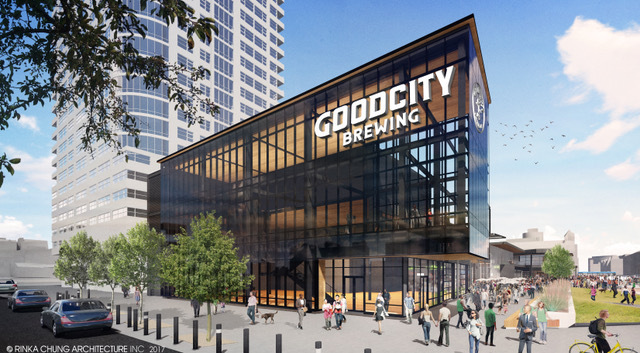 At a press conference held just outside the new Downtown arena, Bucks president Peter Feigin formally announced the first anchor tenant for the upcoming arena entertainment block: Good City Brewing, which will open a second taproom, production facility and event space in the building located at the corner of 4th Street and Juneau Avenue. 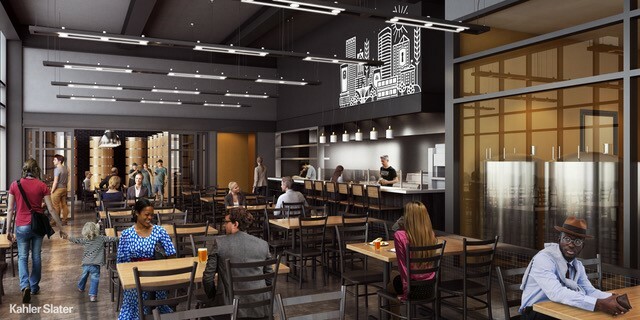 It's obviously a big step toward filling out the future Downtown Milwaukee hotspot – set to open next spring – but it's also a massive move for Good City, graduating the East Side craft brewery into a massive spotlight in just a little less than two years of existence. So after today's press conference, OnMilwaukee chatted with Good City co-founder Dan Katt about making the leap into the second space, its particular emphasis on sour beers and its early plans for the high-profile taproom. OnMilwaukee: How did you know that this was the right place and time for making that leap to a second location? 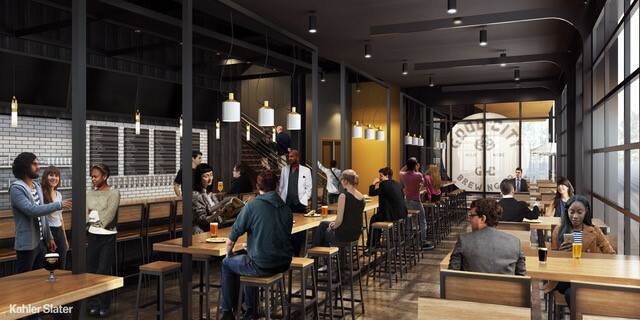 Dan Katt: It's a once-in-a-generation project, so when we heard that these guys were looking to bring a brewery down here, we thought, "Why not us?" We felt like we were already, in two years, able to create an atmosphere and deliver a product that people enjoy. So it just seemed like it fit really well with where we were headed. What is it about sour beer that's really exciting for you right now and something you want to focus on in this new space? The industry's seen so much growth in IPAs and hops – and we certainly make a lot of those beers, as well – but it's kind of an old flavor profile that's being brought to life. So for people who are really into craft beer, sours are something that you'll see in their fridge, something that they're trying and still exploring, and maybe something of an uncharted territory for a craft beer. We just feel like it's a nice complement to what we're already doing and kind of helps us fill out the portfolio. As far as design, is there anything about this new venue that's going to be special for this location as opposed to the original East Side spot? There's a lot of stuff we want to carry through, because it's still our brand and it's still Good City, so we want it to feel recognizable and comfortable for the customers who've already come to visit us. That first floor brewery setup will feel similar to Farwell in that it'll be kind of behind the bar. The sour barrel-aging facility will be really cool because that'll be down at the end. Really, we'll have to be creative about how we plan for pre- and post-game activities, so that's a big part of what's going into the design for the first floor. On the second floor, which is going to be primarily focused on events, it'll be complementary to what we already have going on. We can get about 125 to 150 people in our event space on the East Side; this will be for groups that are larger than that, so there won't really be any competition between those two spaces. And then I would expect that we'll have expanded hours down here. We'll be open every day. We're still kicking around how early, but I could definitely see situations where people are coming in to have a cup of coffee or have a business meeting or something like that. We're working through those details. How involved will you be with the Bucks in terms of post-game, pre-game stuff and other arena events? We'll be super tuned-in to everything that's going on in (the new Bucks arena), but at the same time, we know we need to stand on our own two feet. We can't just expect that people are going to show up because they're across the plaza – although hopefully that's part of it. I think when it comes to programming in the plaza and programming in the building, we'll be building some of our stuff off of that. The first year is going to be a big learning experience I think for everybody. Are there any particular activities you're looking forward to activating here? We'd like to do more with live music than we have. We do some shows in our space now, but it's a fairly small space. I think we'll do more sit-down banquet-type events because, again, with 100 seats, it is a challenge. And we'll do more with events – more with beer-related events and beer festivals. We have our upcoming anniversary party, so we'll think about doing that down here. Beer releases, things like that. You guys did a special beer for the Milwaukee Film Festival. 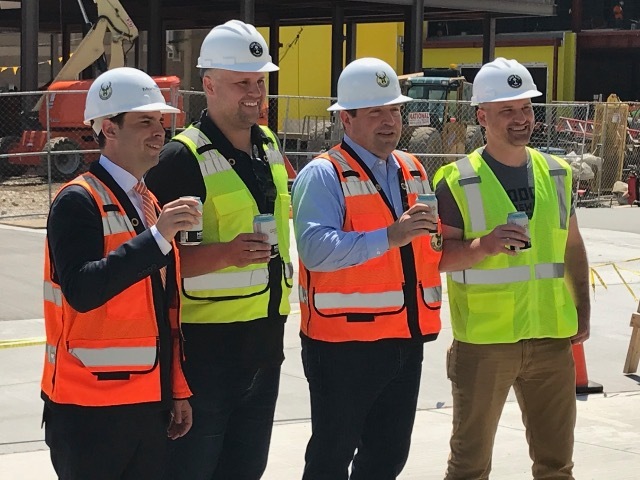 Is there any chance of a Bucks beer in the future? (Laughs) Yeah, I don't know about that one. I don't know if we're the only one in that conversation.